The Gold Coast Convention and Exhibition Centre is just a handy ten minute walk from Sandpiper Beachfront Apartments at Broadbeach. The perfect accommodation near the Gold Coast Convention and Exhibition Centre. Whether you are visiting for business or recreation, we have a set of accommodation options well worth your consideration. Not only are the Sandpiper Beachfront Apartments super close to the Gold Coast Convention and Exhibition Centre, you’ll find other amenities that will make your stay a memorable one also rather close at hand. Just a stroll away, you’ll find an abundance of eating places, (more than a hundred) – more than enough choice to satisfy. Across the road, Old Burleigh Road is Pratten Park, over a kilometer stretch of parkland that divides the street from the beach, also equipped with public BBQs, walking paths and enough space to throw a frisbee. For any shopping essentials, the Oasis Shopping Mall is just 50 metres away. And did we mention the beach? That’s also across the road. There are two fully patrolled sections of Broadbeach for you to swim in confidence. 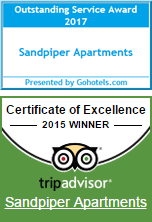 Sandpiper Resort has one or two fully self-contained bedroom apartments that are all ocean facing, with apartments above the third level sporting spectacular ocean views. Each apartment also has a private balcony. If you are anticipating a longer visit, all apartments are equipped with kitchens and full laundry facilities. Each apartment has a modern, vibrant and stylish interior, with comfortable furnishings that make the return to your apartment a pleasure after a hard day at the conference. The common area beneath offers excellent recreational opportunities with an all-year-round heated pool, and accompanying spa and undercover BBQ and dining facilities too. On the forecourt, a tropically themed lawn sports a generous number of sun loungers, with a number of large sun umbrellas and tall palms providing shade for those who need it. For accommodation near the Gold Coast Convention and Exhibition Centre, take a look at the Sandpiper Beachfront Apartments first.